Superior Bronze casts Tin Bronzes, Leaded Tin Bronze, High Leaded Tin Bronze, Red Brass, Yellow Brass, Manganese Bronze, Silicon Bronze, Aluminum Bronze, Nickel Silver, NiVee Bronze and Cupro-Nickel. In addition, we cast Pure Nickel, Monel, 304, 310, and 316 Stainless Steel, Pure Copper, as well as, nearly all Aluminum Alloys. All of these metals are cast to any specification which may be required: ASTM, SAE, Army, Navy and Federal. Our molding capacity is sufficient to employ 17 molders. We have seven Jolt Squeezer machines with the balance of our molding space devoted to floor and bench work. Our melting capacity consists of two 750 pound Detroit Electric Furnaces and ten gas fired furnaces which enables us to melt and pour 18,000 pounds per shift. Additionally, we pour castings in sizes ranging from ounces to 1,000 pounds in brass and bronze. In Aluminum Alloys, we pour castings in sizes ranging from ounces to 600 pounds, in Nickel Alloys from ounces to 400 pounds. The following describes the quality system employed to insure compliance with inspection systems requirements of MIL STD. MIL-I-45208A. Quality Control Supervisor: James Welsh Sr.
2.1 All current drawings and specifications are filed with notation made as to order number and date issued. As new orders are received, they are reviewed for revision changes to drawing or specification. 2.2 Drawings and specifications are controlled by the order entry department. 3.1.1 Ingot- The chemical certificate received with raw material in ingot form shall be reviewed against the applicable specification. Material that conforms to the applicable specification shall be marked as to material type. Material not conforming shall be tagged and returned to the supplier. 3.1.2 Return gates and risers - Containers plainly marked as to material type are used to identify these items. 3.1.3 Material that can not be identified is not used without purchasers consent. 3.1.4 At no time is non-conforming scrap material used. 3.1.5 Each lot of castings shall be identified by a heat code. The heat code shall be to the purchasers requirements and identify the lot of castings. A lot consists of all castings produced from one furnace melt. 3.1.6 All non-conforming rejected and scrap material shall be plainly marked and placed in the hold area. 3.2.1 All acceptable raw material is stored in the furnace room. 3.2.2 Raw material in ingot form is placed in designated areas plainly marked as to material type. 3.2.3 Returns, risers and gates are stored in suitable containers that are plainly marked with material type. 3.2.4 Unacceptable material or unidentified material is always tagged accordingly and not kept in the furnace room, but in the hold area. 3.2.5 Finished castings are stored in the shipping room plainly marked as to status. 4.1 Pattern storage card - Card lists company, pattern number, number of pieces per pattern, core box number and storage location. 4.2 Customer order form - Form lists pattern number, customer purchase order, number of castings on order. Number of rejected castings and number of accepted castings are listed. 4.3 Melt make-up and melting temperatures are recorded. One copy is kept with the foundry foreman, a second is on file in the office. 5.1 Castings are visually inspected 100% for foundry defects. Foundry defects shall include, but not be limited to, adhering sand, visual cracks hot tear, surface porosity and shrinkage. 5.2 Dimensional checks shall be made on sample castings prior to proceeding with the production run. Dimensional checks to be made by an in-house inspector and the purchaser. 5.4 Each lot of castings shall be inspected for chemical and mechanical conformance with the applicable material specification. 5.5 All material certifications received with raw material is reviewed for conformance with applicable specification requirements. Verification shall be performed if problems with the finished castings chemical analysis indicates that the ingot make-up is questionable. 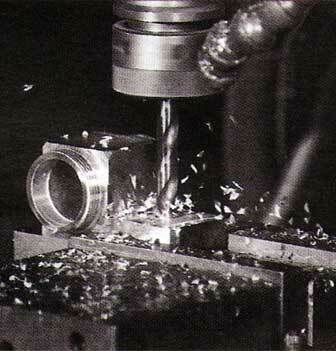 5.6 Molding and core making operations are under periodic inspection of no less frequency than once each half shift. 5.7 Pattern equipment is visually inspected upon receipt and prior to each run. If any damage is discovered the purchaser is advised before any corrections are made or castings manufactured. 5.8 Upon request by the purchaser additional checks such as X-Ray, Liquid Penetrant and dimensional will be made of the castings and/or pattern equipment. 6.1 Pyrometer is calibrated at a frequency of every six months. The pyrometer shall be tagged with a label indicating last calibration date and stated date for re-calibration. 6.2 Testing laboratories used for providing chemical and physical analysis shall be audited at a frequency of not more than a two year interval. 7.1 Chemical reports received with all raw material is signed and dated and placed on file. The report shall indicate date material received and purchase order. 7.2 Chemical and physical test reports for furnished castings shall be signed and dated and filed by customer. 7.3 Melt make-up and pouring temperature is on file for each material. 8.3 Repair of castings by welding, brazing, and impregnation shall be done only upon written approval of the purchaser. 8.4 Castings that show injurious defects revealed by machining operations subsequent to acceptance will be reviewed for cause of defects. Purchaser shall be advised of corrective action required. 9.1 The purchaser or his accredited representative shall have access to the Superior Bronze Corporation facilities during normal working of 8:00 AM to 4:00 PM. Advance notice is required prior to such a visit. 9.2 Access to the testing laboratories employed by Superior Bronze Corporation can be arranged upon advanced request.